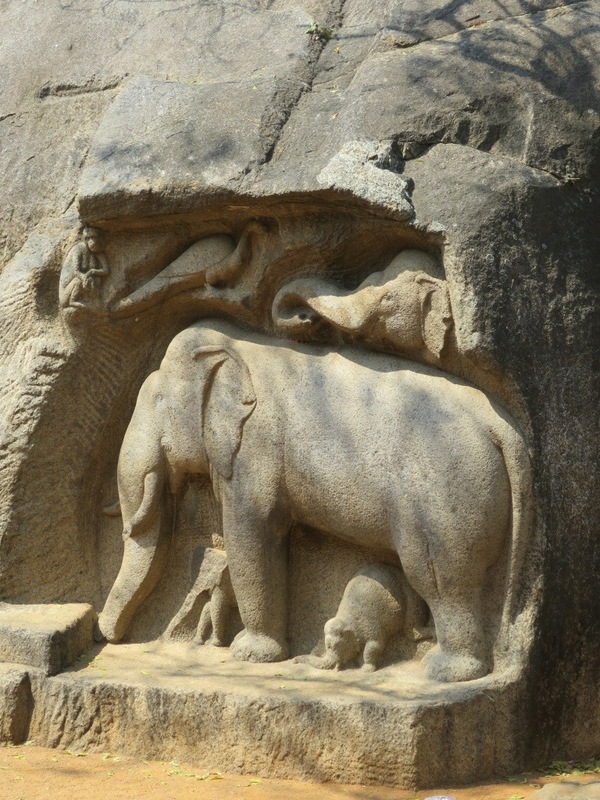 The monumental carved panels, temples and caves at Mahabalipuram were cut from outcroppings and natural formations in the native granite, and include several structures that appear as if they were free standing. Imagine five generations of skilled sculptors let loose in Yosemite National Park, carving continuously for a hundred years. The massive composition known as the Descent of the Ganges dominates the site; the energy and complexity of the carvings are stunning. Scores of figures, as many as 146 by one count, include gods, goddesses, human and half-human beings, mammals and birds gathered around a natural cleft in the granite wall. 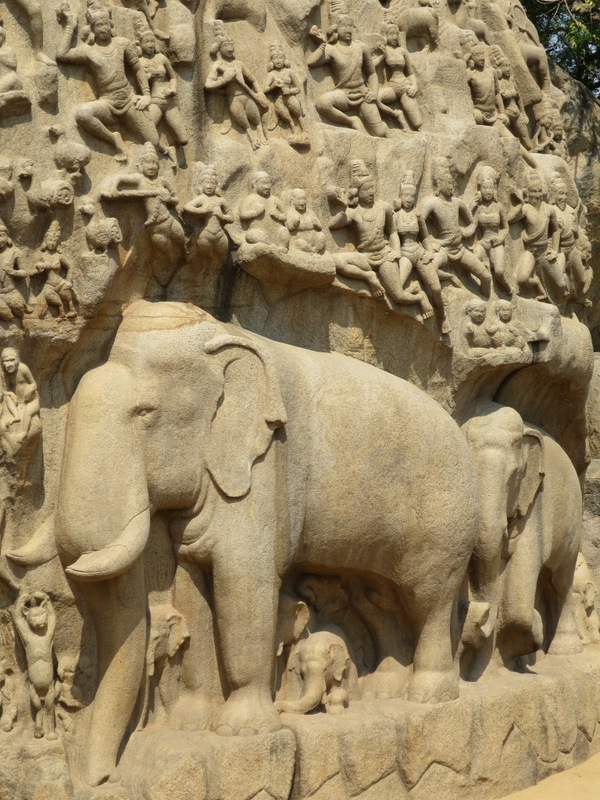 The figures surround the natural fissure; frolicking monkeys mimic holy men, peacocks strut, wary mice watch a cat hold a yoga pose, a deer scratches its nose, an imposingly large bull elephant leads a female and several babies toward the cleft. A cistern once collected rain water the top of the site and then allowed it to cascade over half-serpent, half-human river nagas to simulate Ganga, the Ganges River, descending from heaven through the matted locks of Shiva’s hair. 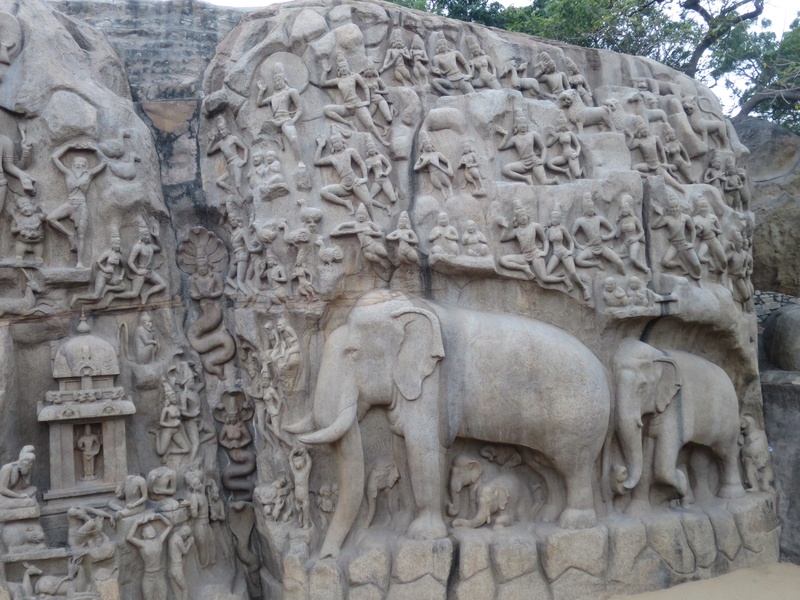 Surrounding the site is the small town of Mahabalipuram. During the week tourists dominate; on Saturday the town is transformed. What were quiet streets and a large parking lot are jammed with people from the surrounding countryside in town for the market. Snack foods and drinks of every kind, souvenirs, shoes, clothes, cheap plastic toys, homemade slingshots, musical instruments, kitchen utensils, religious images and posters of pop stars are laid out on the ground, families of villagers stroll and shop. At a square public tank, steep steps lead to an acre of water choked with lily pads, discarded flower garlands and floating plastic trash. Men, women and children bathe and wash clothes, watched over by a blue half-human, half-fish water god balanced on its tail under a white pavilion in the center. A mandarin orange sun sets behind a temple; to the east, a full moon lifts out of the Indian Ocean, a lighter orange in the smoke and dust of the Tamil dusk. The East Coast Road from Pondicherry to Chennai passes clusters of palm leaf and mud huts; gaudy temples with their plaster gods; women raking salt from shallow ponds into dazzling white piles, the angle of repose reached first in small, then larger cones and finally into sacks; wooden carts pulled by twin white oxen with long upright horns painted jaunty red and blue, red and green. Bodies with heads wrapped against the sun crawl slowly through a tidal lagoon submerged to the neck, noodling for prawns and small fish. A man balanced on two lashed planks poles through the shallow water, destination unclear. “Plots For Sale”‘, optimistic real estate ventures with names like Luxor, Sea Breeze and Ocean Village; streets laid out and lined with painted blocks; no houses, no buyers. Five foot tall cinder block walls, freshly painted in red, magenta and yellow with black Tamil script enclose large rectangles of scrub; no gate, no entrance, no discernible purpose. A herd of sixty rust brown goats is moved miraculously across the highway by boys with long, slender sticks. On the horizon a mile away, a nuclear power station raises its stacks over the beach. 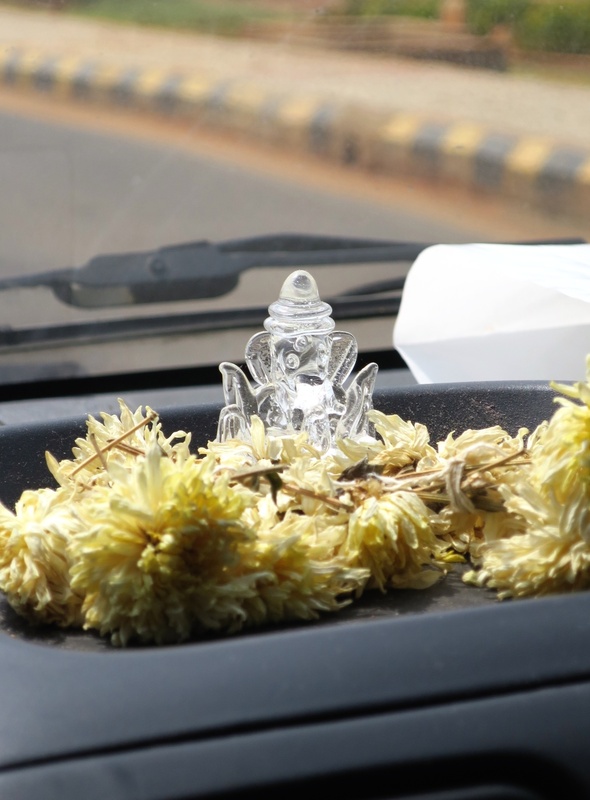 In dimming light the temples pop out from the dull surroundings, polychrome figures piled in tiers, bright blue and acid green vestibules lit by fluorescent tubes; the deities are clearly visible to the world through the narrow vestibule, dark stone bodies draped in garlands and silk scarves of yellow, white and red; fifty mph drive-by darshan. 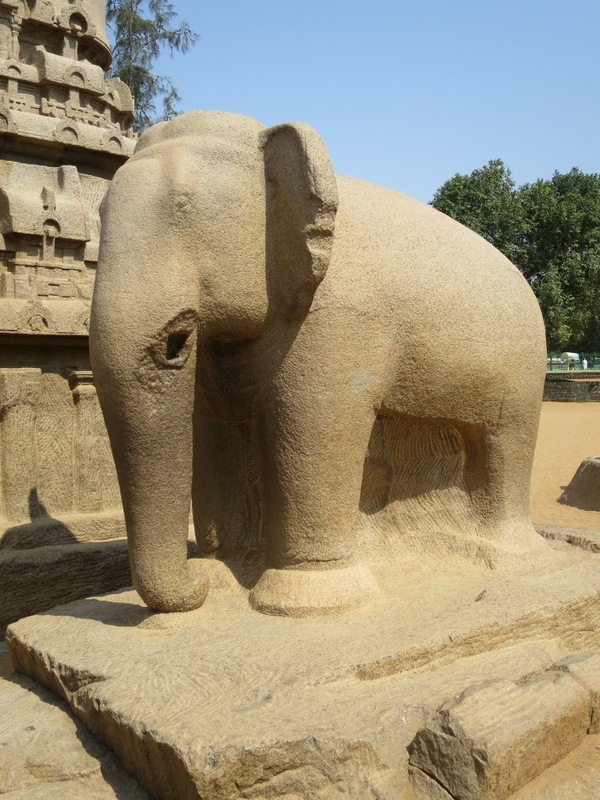 You are currently browsing entries tagged with Mahabalipuram at Annone the Elephant.